To assess what vulnerabilities exist, and how to get rid of a vulnerability or mitigate its risk. Vulnerabilities apply not only to software, but also to hardware, networking, physical access and the social/psychological realm. Try a quiz in Vulnerability Management FOR FREE! Which of these is not a vulnerability? In an expert system operating mode, a process of beginning with a premise and using the knowledge base to justify a solution based on raw input data is called ___________. Can Metasploit be used for vulnerability scanning? After a zero-day exploit patch has been announced, what is the maximum amount of time suggested that will have passed before affected systems should be patched? How often should data custodians patch servers? Immediately applying patches is always safe and prudent. It is recommended that organizations create a PVG. PVG is an acronym for ________. Vulnerability management is the same as vulnerability scanning. 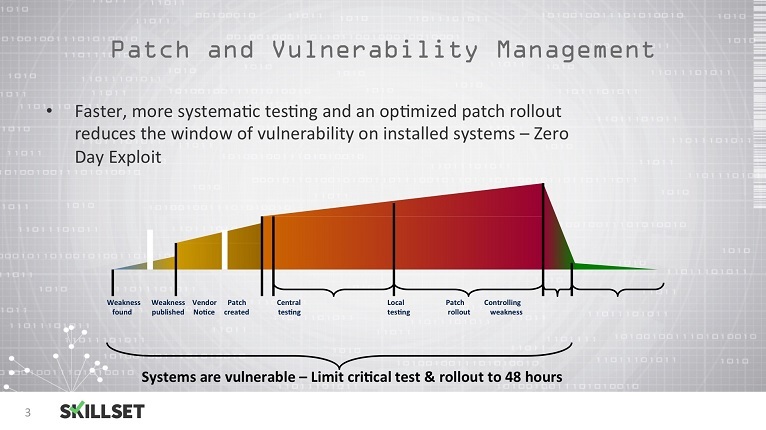 All security vulnerabilities can be mitigated by keeping systems patched.